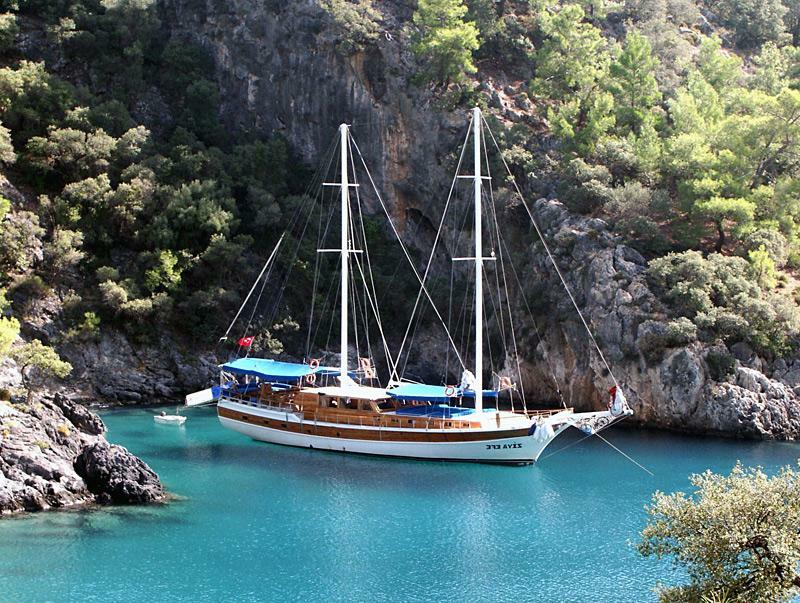 Fully crewed yacht charters on gulets - blue cruises in Turkey along the Turquoise coasts. Blue cruises (fully crewed yacht charters on gulets) are superbly suited to explore the rich ancient culture and natural beauty of the Turquoise coasts of Asia Minor. Your personal crew will tend to your every need and consists of a captain, hostess, chef cook and several deck hands. Gulet cruises are mainly concentrated around the Dodecanese in Greece and along the Ionian, Carian and Lycian coasts of Turkey. Indeed, blue cruises originate from Bodrum. Most gulet charter companies are located in or near Kos, Rhodes and especially Bodrum, Marmaris and Fethiye.
.: Crewed yacht charters, luxury gulets and blue cruises :.